For those of you who haven’t had the unfortunate experience of playing, or rather attempting to play Batman: Arkham Knight on PC, you might be disheartened to find out that the port is a largely broken experience for many. Texture issues like this are just one of a number of graphical problems. We started to suspect impending issues when the game’s minimum requirements section on Steam was updated just a few hours before its launch, an updated that suggested severe optimisation issues for AMD cards. As it turns out, Batman: Arkham Knight is barely functional on both NVIDIA as well as AMD solutions, earning itself a “Mostly Negative” rating on Steam, a NeoGAF thread dedicated to its abundant issues and a User Score of 1.4 on Metacritic – it’s all gone pear-shaped. 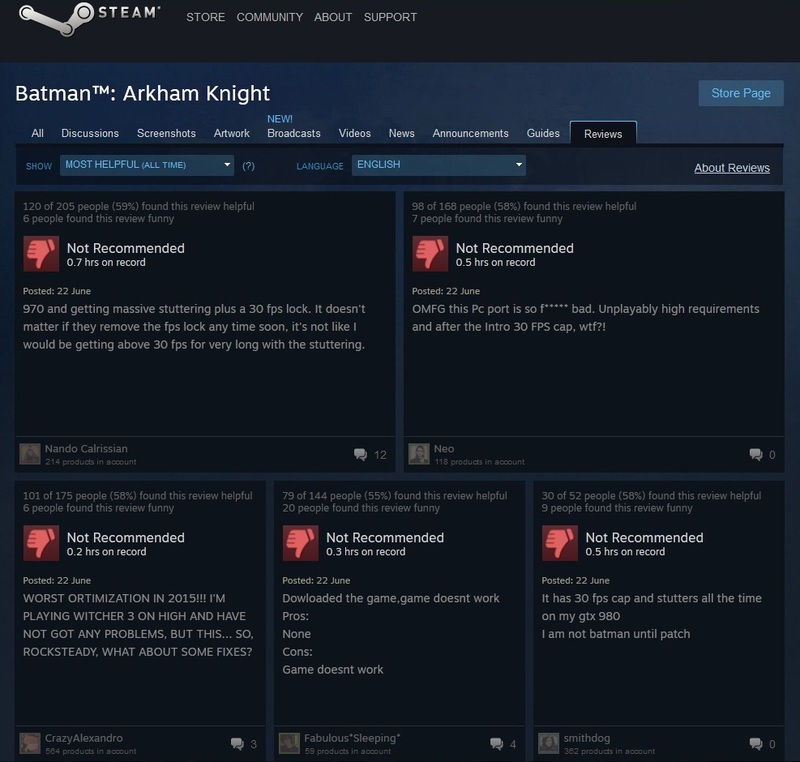 Steam’s community is pretty annoyed with Batman: Arkham Knight’s performance. Image courtesy of WCCF Tech. Expect umpteenth crashes, and according to KitGuru, even a GTX 980 Ti isn’t enough to prevent frame rates from sharply tanking. Apparently, even at 1080p, which should be child’s play for NVIDIA’s newest card, you can expect the game to dip into the low 20’s. Keep in mind that this test was done a fairly high-end PC rig sporting an “Intel Core i7 5820K, 16GB of DDR4 RAM, a Kingston V300 Now SSD and a GTX 980Ti.” And don’t think this high-end rig is the only one. A dual card setup isn’t going to amend any of these performance issues either. Thanks to the YouTube channel Joker Productions and a recently released benchmarking comparison video, 980 Ti’s in SLI produces lower frame rates than a single 980 Ti. NVIDIA has even gone so far as to encourage gamers to disable SLI for improved performance. If you’re okay with the odd spoiler, popular video game critic and journalist Jim Sterling has published a compilation of some of the audio issues, stuttering and graphical anomalies you will encounter. Fortunately, a few of the issues are readily fixable with a few tweaks to the game’s files. For example, to unlock the frame rate cap, find the folder titled ‘BMGame’ inside your root installation folder, then locate the ‘Config’ folder and find the BmSystemSettings .ini file. Once found, adjust the ‘MaxFPS’ value from “Max_FPS=30” to ‘MaxFPS=99999.0000′. Otherwise you will be stuck at 30fps. Beyond that, you’ll have to wait for a patch or update in the near-future. Rocksteady has noted the issues on the game’s forum, but nothing beyond “they’re working on it” is said. Perhaps the most frustrating part of this whole issue is why it happened in the first place. 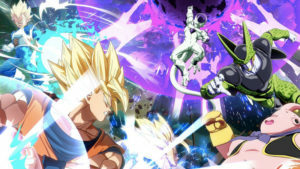 By Rocksteady’s own admission and as revealed by the credits at the end of the game, the PC port was outsourced to Iron Galaxy Studios, a studio largely responsible for console ports. The credits also list 12 people. 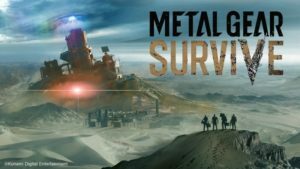 Forgive us if we’re mistaken, but 12 people is nowhere near enough manpower to handle the port of such a mammoth project, especially from a team as inexperienced in PC porting as this one. 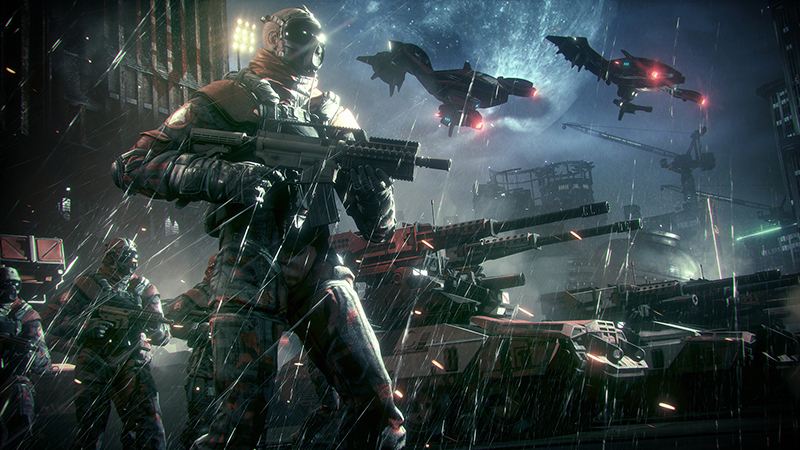 Why did Rocksteady or Warner Bros. think that Iron Galaxy Studios where right for the job? 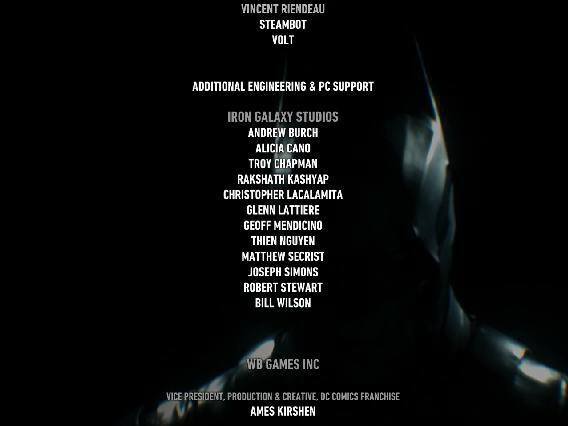 Just by the way, Iron Galaxy Studios also worked on the PC port of Batman: Arkham Origins and we all know how that turned out. 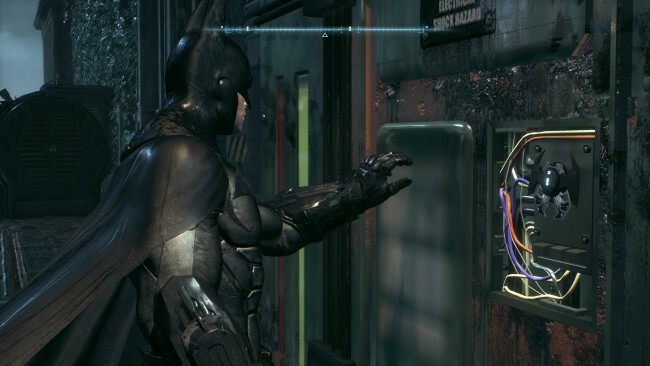 A number of gamers and publications suspect that many of the issues facing the PC port of Batman: Arkham Knight may be down to its use of Denuvo Anti-Tamper software. Some have called it Denuvo DRM, but Denuvo themselves explain that their software is not, in fact, a DRM solution. Instead, their software acts as a force field, preventing the “debugging, reverse engineering and changing of executable files.” They protect DRM systems from being hacked or tampered with. Nevertheless, something is clearly wrong with Batman: Arkham Knight and Denuvo’s software has known to cause issues in prior titles. At one point, it was even reported to damage or otherwise shorten the lives of SSD hard drives. While that’s fixed, we’re still questioning whether the DRM, Denuvo’s software or a combination of the two is what’s causing the issue. Either way, irrespective of who’s ultimately to blame, Batman: Arkham Knight should not have been allowed to release with these issues at hand. This is Assassin’s Creed Unity all over again. Rocksteady and Warner Bros. had better give us a good reason for this, or expect the PC gaming community to start some very real fires. Right now, we don’t much care whether Warner Bros. strong-armed Rocksteady into releasing the PC version before it was ready, or whether Iron Galaxy Studios was chosen to save money. We don’t care why the team wasn’t equipped enough to handle the task, or why the DRM may be causing issues. When you charge this much for a game, we expect it to work right. Alternatively, you delay it and fix it.